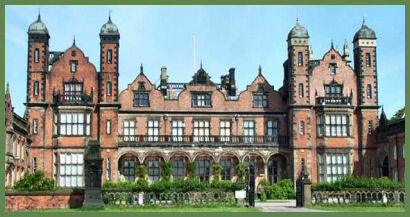 Capesthorne Hall, one of the premier country houses in Cheshire, stands at Siddington in East Cheshire which is five miles west of Macclesfield. The hall has been the family home of the Bromley-Davenport family since 1726. The red brick hall was built in the Jacobean style between 1719 and 1732, the turrets and pinacles were added a hundred years later. Much remodeling was carried out by the architect Anthony Salvin following a disastrous fire at the hall in 1861. The interior boasts a fine collection of antique furniture, art, marble sculpture, and tapestries as well as a treasured collection of Americana and children's toys, greek vases and family muniments dating from 1153. The hall is surrounded by an estate of over a hundred acres. The gardens offer an extremely attractive arboretum and herbaceous borders filled with a rich array of perennials. They are notable for the late summer fragrance of rosa gallica, rosa rugosa and old moss roses. Visitors can also enjoy a small rose arbour, rhododendron woods and walks leading to an arboretum. There are also woodland walks and a nature trail. Throughout the year Capesthorne hosts public events from craft fairs to classic car rallies. The facilities can be hired for corporate occasions, receptions and dinners, business meetings and family celebrations, including wedding parties and civil wedding ceremonies. 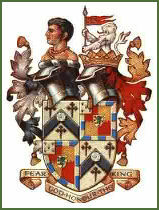 The Davenport family originated with Ormus de Davenport, who came to England after the Norman Conquest. The original Davenport estate was at estate at Marton, near Capesthorne, which was acquired in 1166. Vivian de Davenport had a grant of the hereditary office of Master Serjeant of the Peace of Macclesfield from Ranulf, Earl of Warwick c. 1217-1226, with the power to prosecute criminals, which is why the felon's head is part of the family coat of arms.The pipe rolls dating from before 1254, record Roger de Davenport, Lord of Davenport held the hereditary office of Master Serjeant of the Peace for Macclesfield, in the 1250s. Nearby Marton church, was founded and endowed in 1343 by Sir John de Davenport and his son Vivian, where their mutilated stone effigies may still be seen. Bromley was added to the Davenport name in 1594 with the marriage of John Davenport of Woodford to Mary, daughter of Hugh Bromley. Their great-grandson John Davenport (died. 1733) married Anne, daughter and co-heiress of John Davenport, of Marton. Capesthorne was acquired by the family in 1721 when Davies Davenport of Woodford and Marton married Mary, daughter and heiress of John Ward of Capesthorne. John Ward was the builder of the "New Hall" at Capesthorne, which now passed to the Davenport family. Davies Davenport's great-grandson, Edward Davies Davenport was responsible for the architectural remodelling of Capesthorne in the mid nineteenth century, contracting Edward Blore to re-build the house in the Jacobean style, which was undertaken between 1837-1839. This building was severely damaged by fire in 1861, and was rebuilt by Anthony Salvin. Walter Davenport, a clergyman, reversed the order of the surnames in 1822 ( the previous order of surnames was Davenport Bromley) and his son, William Bromley Davenport (1821-1884) succeeded to the Capesthorne estate in 1867 on the death of his cousin, Arthur Henry Davenport. When he died without issue, Capesthorne Hall passed to his cousin, Walter Henry Bromley-Davenport (1903-1989), who opened Capesthorne to the public in 1955. The current owner of the hall is his son, William Arthur Bromley-Davenport.